The PRS Dragon III is a nice guitar but expensive and would you play it at this cost? Read a review of this rare instrument. Of course the problem in reviewing this exact guitar is that it has never been played since the day they packed it in it's box and sold it to an employee who eventually sold it to me. Am I going to play the Dragon III? Unfortunately not. Firstly, I completed a video review of this PRS Dragon III. I showed the main features etc. so let's get some of that down in to print here. The very first time I saw this guitar I thought what a great piece of kit this guitar is. 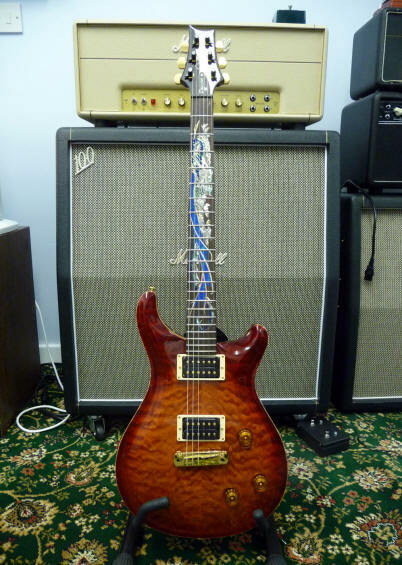 This is a 1994 PRS Dragon III with a unit number of #55 out of around 100 pieces made at the time by PRS. It was clear to me from the outset that this guitar had never been played - you could tell immediately. In any case the story of this guitar goes something like this. Back in around 2009 (maybe) I was walking around a world famous guitar show and one guy had about five or six PRS guitars, a 1953 Gibson Les Paul Gold Top, and an array of other guitars by famous makers. This guitar was on the presentation table along with another rare PRS guitar, a PRS 'Rosewood' guitar with rose pattern on the neck - of which I had never seen one of those before. Indeed that guitar is shown on my videos on YouTube at www.youtube.com/tonymckenziecom if you want to dig a little. It was the only 'rosewood' guitar that had the Brazilian rosewood actually finished in lacquer - and that has since been confirmed a number of times by others. Anyway, I spoke with the guy selling all the guitars and he said that he used to be an employee of PRS guitars - pretty high up the chain too. PRS used to allow employees to buy guitars from the company, but if a 'certificate' was typical, then PRS did not supply the certificate to the employee for some obscure reasoning. I would like to tell you the answer to that, but PS does not answer letters when you write to him. Probably could not be bothered. In any case, the ex employee (who had moved on to other major music related companies) said that he had bought it 'new' while at PRS and he had stored it unplayed since new - and he guaranteed it! You know what, he was right, this guitar even has the original strings fitted exactly as fitted at the factory. The ex employee proved the position to me without a shadow of a doubt. Indeed he did not really play guitar either. The guitar was in its case in the original PRS shipping box. Well as you have already seen, this guitar has the dragon III neck, it is a 22 fret Custom style with gold hardware all round and a new style stop tailpiece of the Dragon era. The neck has a Brazilian rosewood fingerboard and of course the body has a really well book matched top. Back is probably mahogany. The neck appears to be a 'wide fat' neck, as opposed to many other PRS guitars that sport the 'wide thin' neck profile. Actually the neck profile feels good in your hands. The Dragon III inlay on fret board made from 238 pieces of gold, red and green abalone, mother of pearl, mammoth ivory (yes really) and stone, limited production run of 100 guitars. It is highly likely these pickups on the guitar are Dragon pickups similar to the Dragon I guitar first produced in around 1991/2. The stop tailpiece is currently fitted on around half of all PRS guitars today, but had its roots on the Dragon guitars. As you can see, the gold on the dragon around the wings is actually solid gold, as is the PRS signature on the headstock - actually solid gold and sunk in to the headstock. The Dragon III has a really solid leather case which although similar to the 'Artist pack' case has a different handle on there. I own two Dragon guitars and both have this same case. The Dragon 2002 review is online too right now. It seems that PRS has had a bit of a run with Brazilian rosewood, and that's a little surprising because of the legislation stopping Brazilian rosewood from being imported to the USA and elsewhere. It's very rare and now expensive wood and is controlled very carefully these days. But maybe in 1994 when this Dragon III was made it was all different. There's one thing for sure, it costs money now. The 2012 value of this guitar (in a mint condition but played) is likely to be $12000 to $15000 dollars in the USA but of course in Europe you can probably convert that $ sign to a £ or even a € Euro sign (if it still exists after 2015). But they are continuing to drop in value each and every year because of the economic times at present. But is it worth the money? Well that's a good question I can't easily answer. I have never played this guitar although I really would like to. It was bought as an investment but alas it has devalued year on year (as every Dragon they have ever made has of more recent times). It's true that in the early days of the dragon guitars that prices did soar upwards, but now the whole world or at least most of it is going through that austerity time guitars like everything else fall in value. Check out the Dragon 2002 review to find out more about that. Overall the build quality is superb. The book matching of the top is near enough as perfect as that on any guitar I have ever seen from any maker - and it lends the question of how it compares to the newer PRS 'Private Stock' and 'Collector' pieces of recent times. Actually, I don't think any of that is any better than this Dragon III. Everything about the guitar is quality and whether the price goes up or down, that does not affect the quality. Because this guitar has never been played, I suspect that I could put this one up against the new stuff all day and be at least as cool as those and probably better. Well how would I sum up this guitar? Actually it's a really great guitar; but my challenge is only half complete; like the pint of beer that's either half full or half empty depending on how you see things. Unfortunately I really can't (or won't) bring myself to play this one. So the story is going to end really based on what I know about this guitar and what I have seen as opposed to what I have heard; because I have never heard this guitar being played. The last guy who will have played it (for sure) will be the employee at PRS who did the final audio test on this instrument when it was made at the factory back in 1994. The book matching of the top - perfect! Score out of 10: Well for most things I would score this an unequivocal 10 out of 10, but there are a few things that stop me doing that. I play guitars really, I don't usually save them for investments. But I did this one and lost money on it. The fact it is not played stops me playing it (yes really) and I don't like that either! So my final score is going to be a 9 out of 10. You may disagree, but given the whole circumstances of this guitar that's the MAXIMUM I would give it. It's not the guitars fault really, just the circumstance of this one. Devalued effectively by PRS issuing range after range, unused - a real pain, the 'snob' factor... put it all together and there's a nine if ever there was one. But it's a great guitar - and if you buy one for the RIGHT reasons, don't care about later value etc. then this guitar at the right price would be a perfect 10. I hope you like the above review and video review (where you see much more in this case on the Dragon III) and I look forward to seeing you on this site again sometime soon. Feel free to contact me if you have any questions about it.